Sadly, the Aboriginal Art Museum of Utrecht (in the Netherlands) is no more. It was innovative, didactic in introducing the Dutch to our Indigenous cultures, it was challenging, it even had a collecting budget! I wonder whether it was ever funded by DFAT or the Australia Council to carry on such valuable promotional activity? Now it's 800-piece collection “ranging from paintings on canvas from the Central Desert regions to bark paintings from Arnhem Land, sculptures from various areas and photographs and video art by urban artists of Aboriginal descent”, which, in 2001, was based on the donation of an anonymous Dutch-woman, will be scattered around three existing Dutch institutions. They operate under the group name of the National Museum of World Cultures, which officially amalgamated in 2014, and whose mission is to help foster and preserve an open-minded view of the world. Between the three, they contain over 400,000 items, which might suggest that the AAMU's Aboriginal art could simply disappear between the National Museum of Ethnology in Leiden, the Tropenmuseum in Amsterdam and the Africa Museum in Berg en Dal. But Stijn Schoonderwoerd, General Director of the NMWC, said about this acquisition: “We are very proud and happy that the most important collection of Aboriginal art outside Australia is being entrusted to our care. This means we can immediately extrapolate the historical line from the national Australia collection we manage all the way to the present time”. Arguably, the Kluge-Ruhe Collection at America's University of Virginia with 1700 plus paintings and numerous objects, is more “important”. But they haven't been a patch on AAMU when it comes to curating their collection excitingly. In 2008, Brook Andrew created a wild'Theme Park'; in 2010, 'Breaking with Traditions' featured Aboriginal art beside works of the Dutch 20th Century CoBrA Movement headed by Karel Appel; in 2011, 'Be My Guest' encouraged 10 Dutch contemporary art curators to chose counterpoint works to go with art from the collection; and AAMU closed with 'Tracking Memories' in which Aboriginal art, European art and African 'colon' art struck off each other. Meanwhile, Gordon Bennett, Paddy Bedford and Bindi Cole had solos, while the Laverty Collection selected five leading artists to show in 2012. In 2006, the AAMU was the obvious place for Wik people to hand over a suite of Apeleche Poles to apologise for killing a Dutch sailor from the good ship Dyfken on Cape York in 1606! The museum also published several exhibition catalogues and an extensive museum catalogue. In 2016, King Willem-Alexander and Queen Máxima opened the successful exhibition Mapping Australia. Georges Petitjean has been curating shows at AAMU for 12 years and has been a regular visitor to Australia. Asked what his highlight had been, the response was, “There was an exhibition we did in 2008 called Nomads in Art. That exhibition included four desert artists: Dorothy Napangardi, Kathleen Petyarre, Lilly Kelly Napangardi and Jackie Kurltjunyintja Giles and also included the work of Belgian artist-poet, Marcel Broodthaers (1924-1976), a conceptual artist who recently had a retrospective at MOMA in New York. That was definitely one the exhibits I consider to be one of my favourites”. Ironically, Petitjean had recently seen a consolidation of Dutch university collections and some works from the private Tomas Vroom Collection at AAMU. When I last visited, optimism was high with a weekend talk by an academic who'd researched at Ramingining well-attended. During the week, 30% of visitors were schoolchildren. There were bikes in the window with Aboriginal designs reflecting the Tour de France starting from Utrecht that year. And now it's scattered. But Petitjean is not too down-hearted: “A positive development is that the entire collection and library will go to a national collection. So the AAMU has succeeded in one of its most important missions; to give a permanent presence to Indigenous Australian art in Dutch museums. It also means that this is the most important collection of contemporary Indigenous Australian art in a European national museum. I hope that they will pro-actively use this collection and remain committed to enlarge it, which is important because contemporary art presents a more nuanced picture of globalisation”. “On a personal level”, Petitjean continued, “ I will continue my engagement with Aboriginal art and in the short to mid-term curate an exhibition in Switzerland, and write a book amongst other tasks”. 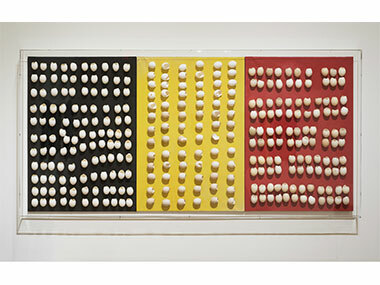 Art from the 'Nomads in Art' show at AAMU - 'Untitled (Triptych)' by Marcel Broodthaers - just a hint of a dot painting?